Ella wants a Princess Party and her mom wants to have a pool party. 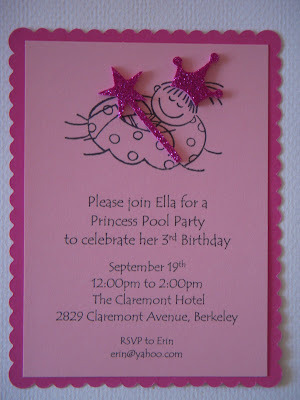 Erin called me and said "have you ever done invitations for a Princess Pool Party"? I hadn't and this was the result, they were both thrilled! Henry and Emily are siblings about 2 years apart and their mom wanted to have one party to celebrate their birthdays. 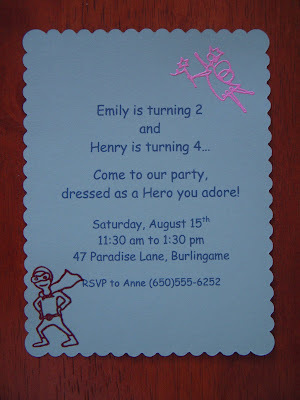 Emily wanted a pink fairy party and Henry wanted a Super Hero/Spiderman party. Henry agreed to the pink fairy at the top and the "girly" scalloped edge. Emily agreed to the blue invitation and has already picked out her fairy costume!